The pretty fishing village of Downings lies on the edge of Sheep Haven Bay in the north of County Donegal. Donegal is rapidly becoming one of Ireland's best golfing destinations and the secluded Rosapenna is where the old meets the new. Golf at Rosapenna dates back to 1891. A triumvirate of former British Open Champions – Old Tom Morris, James Braid and Harry Vardon – created the Old course and it still represents a fine challenge. But it was Pat Ruddy, the man behind the European Club, who put Rosapenna firmly on the map. His new course, Sandy Hills, will surely end up on every serious golfer's must-play list. Sandy Hills quietly opened for play in June 2003 and slowly, but surely, the golfing world began to recognise that this course is special. Old Tom chose to route the Old course alongside the dunes, but Pat Ruddy had different ideas – he decided to carve straight through them and this is presumably how the name Sandy Hills came into being. Right from the off, you are in a lunar landscape, among gigantic dunes. Going over and through the dunes provides a platform to drink in the stunning views across the Old course to Sheep Haven Bay beyond. Measuring 7,183 yards from the back tees and with the par set at 72, Sandy Hills will test the very best. Each and every hole has precise definition with the hummocking fairways framed by the dunes, so the immense challenge is always clearly visible from the tees. Whatever you do, don't stray too far offline, otherwise you'll be lucky to find your ball in the dunes. And make sure that your approach shots are accurate too, because the greens are invariably cut into the dunes or sited on elevated plateaux. Rosapenna was worthy of a visit just to play the Old course, but Pat Ruddy has improved on that too, by remodelling the back nine. They’ve called the new-look course the ‘Old Tom Morris Links’ after its eminent original designer and it opened for play in September 2009. But it's the Sandy Hills course that everyone is talking about and there's only one way to find out how good it really is. American architect Beau Welling – who renovated the Quinta do Lago (North) course to great critical acclaim in 2014 – has recently been involved in “softening” the Sandy Hills course a little bit. The first hole is now a sensible par five (instead of a murderous long par four opener) with a penal bunker removed from the front of the green. Similar bunker removals have also taken place on holes 4, 9 and 13, allowing ground game approach shots to reach the green. New fairway bunkers have been installed at holes 1, 5 and 8 whilst, on the back nine, the right doglegged par five 13th has had a new green installed, along with three new bunkers down the left side of the fairway. Completing the renovation, the reshaped home green is now angled at 45 degrees to the line of play, with shaggy mounds installed at the back to shield the 18th green from the car park. The severity of the green contours on holes 10, 12 and 16 still give some cause for concern so it appears that they’re next in line for some remedial work in the near future. It’s always good to see new golf courses evolve in their early years as owners react to constructive criticism and Sandy Hills is certainly no exception to that process. Rosapenna is the real deal, proper linksland. You get sight of this on the drive in as huge rolling dunes catch your eye. I’d go as far as to say that it’s the most impressive duneland I’ve ever seen around a golf venue. I’d highly recommend starting your Rosapenna experience on the Old Tom Morris Links first which is well worth playing on its own merits, and it’s on the back nine of the Old Tom Morris Links where you’ll catch your first glimpse of the massive dunes donned with orange flags. That my friends is Sandy Hills, and she’s a beauty. In truth, I first visited Rosapenna six years ago and played Sandy Hills in a three-club wind. All I can say is that I’ve never been so badly beaten up by a golf course. The bones of a wonderful course were there but it was just far too tough to be enjoyable and the condition of the course, still being fairly new, also needed improving. I made my first return to Rosapenna this month and I’m so happy that I did as the course has improved immeasurably. The greens ran perfectly smooth, maybe the best links greens that I’ve played. The turf conditions are now perfect with that springy links feedback pronounced on every iron shot and the fairways are now much wider and fairer. The blind shots are still there but bunkers have been removed from positions where they didn’t really belong. The green surrounds are closely mown, so whilst many greens are elevated, I found the ground game a realistic option. What remains from when I first played the course is the sheer beauty of this place. Donegal’s a delightfully scenic county with rugged hills set alongside perfect sandy beaches meaning that the views from this elevated property through the first six holes are spectacular, culminating in the dramatic “up and over” 6th with its green perched in front of the backdrop of the sea. The rest of the course is very much submerged within the dunes such that each hole plays in isolation. 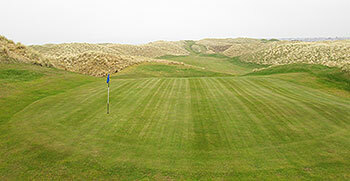 Those dunes are covered with long and wispy marram grass meaning each hole is an absolute picture from the tee. Being set amongst these gigantic mountains of sand, severe drop offs are inevitable. A prime example is the par five 8th where a ball played to the left of the green will just get ejected, so whilst the course is much fairer than it was, accuracy still plays a key part in the course management strategy. From the first hole with its green located in a trough created by flanking dunes, through to the 18th that’s routed through a valley, there are few places more dramatic. Rosapenna proves to be one of the most spectacular places that I’ve played golf and I hope to see the course rise higher in the rankings as its more mature, fairer self starts to get more recognition. Given time, I firmly believe that Sandy Hills could be making its way into the World Top 100 so get there first before the prices start to be more reflective of a course of this stature. Sandy Hills was the standout highlight for me on a recent trip to the North. For too long, I had been hearing stories comparing Rosapenna and Ballyliffin, but having experienced them all – in my humble opinion – the Sandy Hills course is miles ahead of Ballyliffin in terms of quality, topography and ranking. It’s a non-stop thrilling experience playing through the dunes, with no shortage of difficulty added by blind tee shots and approach shots. Par is a hard earned rewarding score for each hole. Mr. Ruddy never wants to make anything too easy in life. It’s a championship test like no other in the northwest, and in firm and fast conditions, this Donegal jewel will knock your socks off. The jaw-dropping surrounding scenery will take your breath away as will the routing that Mr. Ruddy discovered in this idyllic setting. The opening 6 holes are outstanding with a healthy mix of long and short holes, but each just fits the land perfectly as you climb up and down the dunes. The quality continues the entire way through the back nine and I walked off the course wondering how on earth this course doesn’t get more awards. Sandy Hills belongs comfortably inside the Top 10 in the Republic of Ireland, unlike other big names in Donegal. On a beautiful day, it’s one of those courses that you wish never came to an end. Add in the Old Tom Morris course as a perfect complement to the might of the Sandy Hills championship layout, and you’ll experience a glorious piece of the Emerald Isle. Played today, overcast then glorious sunshine, wind manageable up to 3 clubs. Loved Sandy Hills, a very tough course but a great experience. We didn't see anyone else or on the course, strange given the very long overdue sunny weather we are mercifully enjoying in this lovely corner of Ireland. In many ways the course reminded me of the sainted Castle Stuart if a bit harder - very fair, exciting, scenic, great sense of isolation on each hole, views down to the water over other golf holes, lots of skylarks and the round just flew by leaving one wanting to start again. As noted, it's a tough course and if I could make one suggestion it would be to soften some of the runoffs on the frequent elevated greens. A slightly off approach races off to a collecting gully which is typically heavily divoted. Hypothetically this might lead a player just off the right of the 17th in 2 to thin a lob wedge through the green into the marram and lose the match. Hypothetically. Also, the raised greens and chasms make ground shots sadly rare, typically it's all carry, tough in the wind. That said, Sandy Hills is brilliant fun and achieves what Trump Aberdeen doesn't in a similar setting by creating a spectacular but charming place to play golf. Would love to return, clearly the best course we've played so far in the area. Coming back to Rosapenna, I noticed how much more I appreciated Sandy Hills. The course felt a lot friendlier than I remembered it to be. This hunch was quickly confirmed by the pro shop: there has been a lot of tweaking of mowing lines and other design details in the last ten years to make the course less penal and more playable. Having said that, Sandy Hills is still a difficult course, especially if the wind is up or driving is off. The two unfortunately tend to be related for most golfers. In any case, it is not a track I would recommend to a high-handicapper. However, I would advise anyone with the right game to give it a rematch sooner than I did (first visit 2008, second late August this year) because like any other Pat Ruddy design it is a lot less exhausting mentally if you played it recently and can sort out the real trouble from the imagined. Very seldom busy, which means you will likely play at your own pace, which could be fast or excruciatingly slow, depending on how many balls you have to search for. Mr Ruddy has built a magnificent golf course here. Yes the dunescape provides topographic majesty but this adds pressure to deliver. There are architects that would not optimise the canvass provided. Mr R has nailed it. Rosapenna offers a world class 36 holes of golf. Whilst OTM is a more classical links, shy, subdued and tranquil, Sandy Hills is a shock to the senses, a course that hits you over the head but you smile as you realize you've been hit by a rubber chicken ! What I am saying is that the contrast between the 2 courses makes the overall experience more intense. I love the 2 courses at Ballyliffen, but Rosapenna offers more contrast between the 2 courses. In terms of Sandy Hills, the holes are seriously good and it is difficult to recall any weak holes. Standout holes are 4, 7, 8, 9, 11, 17, 18. When a facility has a big time challenging course it helps when grouped with other golf options onsite. Why? It gives players an opportunity to stay away from the layout that's unrelenting in its overall demands. In many ways Rosapenna's Sandy Hills is akin to Bethpage State Park's Black Course in being the flagship course among several layouts on property. Be forewarned: if you can't handle windy days -- often exceeding 25 mph and featuring rough that swallows golf balls faster than "Jaws" ate swimmers -- the simple recourse is -- stay away until one's game is sufficiently up to the challenge. Sandy Hills doesn't sugarcoat things and most certainly -- this is not a hugs and kisses course. A good bit of the reputation of Sandy Hills is where the course is routed. Unlike the other courses at the facility which work around the wild dunes terrain -- Sandy Hills takes clear aim through some of the most intense links land one can encounter. Pity the player who has little control over one's driver -- you may run out of ammo because wildness becomes an expensive habit for one's golf ball budget. Let me hasten to add -- the difficulty meter is no less when playing County Down, or Dunluce at Portrush or Muirfield but for whatever reason Sandy Hills gets star billing as being seen as way too tough and beyond playability. I don't view the course that way but the caveat for all players is rather straightforward -- short of those legitimate low single digit handicaps no one should venture beyond the middle tees. Unfortunately, the people who then whine about fairness should simply look in the mirror and ask themselves why they attempted to play a course beyond their capabilities. The elements are also front and center when playing. As I mentioned earlier -- the daily breezes that blow can be savage like in the manner they can erode a player's confidence level. If your swing is not sound there is little doubt it will quickly unravel in a big time manner. Without beating the main point too many times -- if you can't get off the tee consistently at Sandy Hills the game is over - and the goose that's cooked will be you. Sandy Hills starts with a par-5 hole that truthfully can be reduced to a lengthy par-4 for the really top tier players. As a par-5 you have an opportunity to get off to a much needed good start. At the long par-4 2nd reality hits you in a big time way. The long par-4 is a demanding hole -- featuring a bottleneck fairway of epic proportions. Being in the fairway is an absolute must as the green is quite finicky on accepting any approach not well-played. The par-3 3rd is a good change of pace hole -- often subject to major cross winds. Take enough club as being short doesn't yield anything but trouble. The next three holes are quality par-4's -- each different from the other -- each requiring quality tee shots to get things going in the right direction. At the 4th it pays to stay left as major trouble hangs near the corner of this dog-leg right hole. At the 493-yard 5th you don't see the landing area which only adds doubt to one's backswing when standing at the tee. Once again Ruddy adds a bottleneck fairway so being long is fine provided you keep the ball on the short stuff. The approach must also be hit with a marriage between proper trajectory and accuracy. When you come to the 6th you come to one of Ireland's grandest holes. You don't realize this when standing on the tee because you're hitting slightly uphill to a blind landing area. Staying left in the fairway can provide a speed slot for added yardage. Just be mindful of the right side as the fairway comes to a halt. As you walk towards the crest of the hill you see Sheephaven Bay in the nearby distance. On a clear day you can see for miles. Just be sure to refocus on your approach -- with the green nestled down below. Any player walking off the green in four strokes should have a Guinness awaiting them at the clubhouse! Once you get past the 6th Sandy Hills gives players a bit of a respite for the remaining holes on the outward half. Mind you -- I never said the word easy or simple. The par-5 8th is a gem -- reachable certainly for the strong players but the falloff to the left of the putting surface is absolutely vintage stuff -- you miss on that side and it's almost a near certainty that birdie, and possibly even par, will not be marked next to your name on the scorecard. The 9th is a quality par-4 -- featuring a split fairway bolstered by a center-placed grass bunker to a green appropriately contoured. The inward half commences with one of the most daunting tee shots you encounter at Sand Hills. The 10th starts from an elevated tee and you see the green in the nearby distance. The hole is not especially long at 405 yards but again you face a fairway that bottlenecks. Strong players can attempt to get near the green but the risk is truly high and the gain fairly little. The slightest push to the right will have you say aloud to your partners -- re-load. The green is one of the toughest too. Banked from back to front and placed on a slight angle that puts those on the left side in a demanding position. There are other longer par-4's at Sandy Hills but the 10th is pound-for-pound just stellar stuff. The stretch of holes from #11 thru #14 give the player a bit of an opportunity to score well but none of the holes is a pushover. They just seem easier than what you've already encountered. The 15th begins the final quartet of holes to the finish and it's a top flight hole. Playing 468 yards and often times with a helping wind -- the hole can be just as tough downwind. The key is getting on the fairway and securing as much run as possible. The green is devilish to hit and hold -- angled superbly and featuring falloffs that will propel away all but the surest of approaches. The 16th is a fine par-3 -- playing usually back into the wind to a green sloped noticeably from back to front. Any shot hit long or too far to either side will likely not walk away with anything less than bogey. Interestingly, the 17th and 18th holes both play the exact same distance -- however -- the former is a 5 par and the latter a 4. Should good fortune shine on the player with a birdie at the 17th -- it's just as easy to give it right back with a bogey at the home hole. Again -- the final hole features a bottleneck fairway and the necessity to avoid bunkers guarding the entrance to the green. Sandy Hills is for players who relish an ultimate challenge. I can only hope ownership will thin out the rough in certain places - not to make it easier per se -- but to allow for attempts at recovery. Such recoveries would not mean the wherewithal to get to the green in all situations but to minimize the proclivity for lost balls and slow play which can sour the day for many. Such a modification would only raise the overall quality of the course. Part of the issue for Sandy Hills specifically is its remote location. Rosapenna is neither in the immediate Dublin or Belfast metro areas nor the highly trafficked tourism areas in the southwest corner in and around Shannon. The range of golf in the northwest of Ireland is certainly a visit that needs to be realized in order to gain an overall appreciation of what vintage Irish golf is about. Sandy Hills is akin to Darth Vader and like any Jedi knight you the golfer had best be able to command one's light sabre -- because when you arrive at the 1st tee the game is most certainly on and you had best be ready. I know there are two 18 hole courses along with a 9 holer in play..are there any signs of the St. Patricks 36 holes coming to life yet? Five years ago, in my last review for Sandy Hills, I ended by saying “I can’t wait to return for another beating”. Well, that day arrived today and despite being truly beaten up as anticipated, I thoroughly enjoyed reacquainting myself with this beast of a course. Before playing, general manager Frank Casey Jnr pointed out a few changes designed to ease the challenge a little since I was last here. A number of the greens have had penal front bunkers removed, allowing a running shot to be played, though several holes have had fairway bunkers installed to tighten up the visual options off the tee. The par five 13th has been redesigned (with a new green installed) as has the 18th, where new mounding behind the green keeps the car park out of sight now. Looking back at the notes on my scorecard now, I’d forgotten just how good the uphill par four 9th is as its split fairway offers two exciting approach options and the heroic carry par threes at holes 3 and 11 are two of my favourite short holes anywhere. I believe that greens on holes 10, 12 and 16 are due to be remodelled next winter and that’s good to hear about the par three 16th in particular because the gradient of its back to front putting surface is way too severe. Great review Jim! I played Sandy Hills in 2010 and it''''s my all time favorite, nothing else comes close. Easing the ferocious nature of this course will lighten many a golfers heart. Thanks for the update! Excellent review Jim. I played Sandy Hills in 2010 and it became my favorite course. Would love to see before and after photos.